(NSFW: Language) Modern Toss broke down its infamous Periodic Table of Swearing into over 100 magnets so you can post profanity everywhere. Then curse yourself when you inevitably lose a piece or two. Japanese artist Bunpei Yorifuji breathes life to nature’s simplest substances in his book Wonderful Life with the Elements: The Periodic Table Personified. A great read for kids and adults alike. 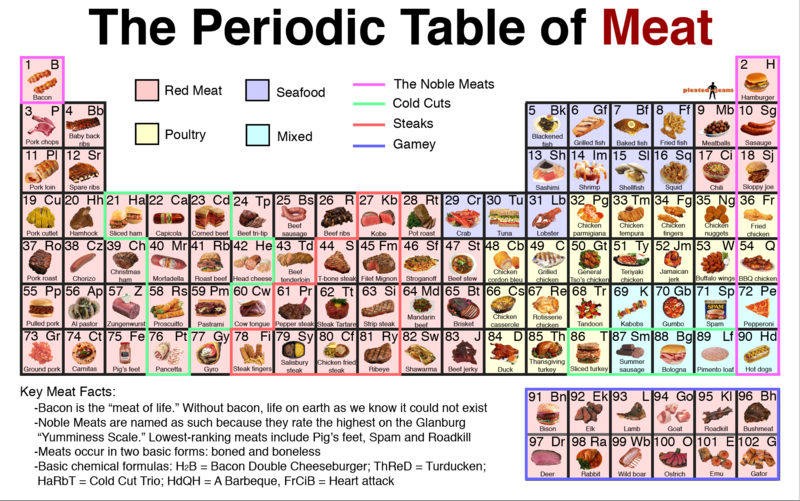 We’ve seen a periodic table of tables, but this one’s more impressive. Wolfram Research co-founder Theodore Gray made this wooden table and filled each drawer (and his office) with element samples. (NSFW: Language) Even better than than the original obscenity-filled table, this version actually swears at you when you push its buttons. And if you’re not British, you’ll learn a thing or two. Clean up your act with element number 92, Uranium. This periodic table-inspired soap bar not only teaches you a science lesson, but it emits a “radioactive” glow when the lights go down. If you loved the Video Game Periodic Table, this Superhero Periodic Table at Geekologie is a who’s who of heroes and villains; remember, kids, He is for Hellboy and Lu is for Lex Luthor.